So remember the other day when I said I wasn’t feeling inspired by St. Patrick’s Day? Well, turns out, I was! I managed to get to the craft store. I had a short list of a couple of things to grab but then I took a little time to wander the aisles and for whatever reason, as it is for creativity, at that particular moment I was full of ideas. 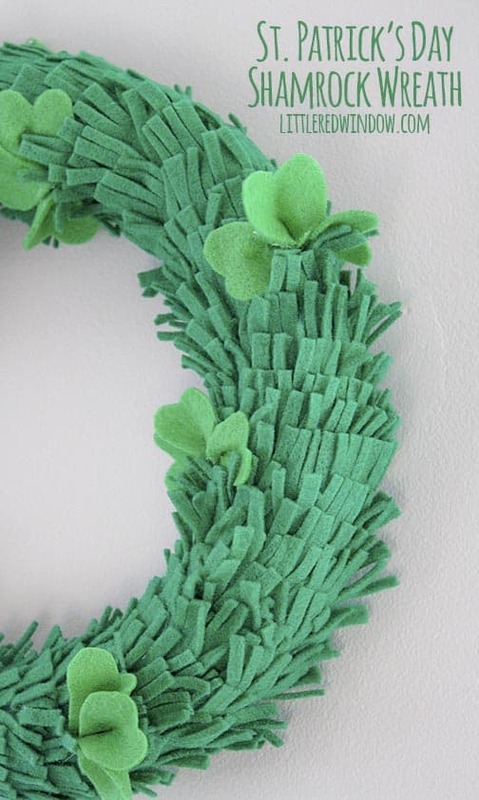 Like I said though, St. Patrick’s Day and the color green are not my favorite, but when I was standing in front of the felt I started thinking about springtime and green grass and I dreamed up this wreath–fluffy green grass with shamrocks nestled inside. Because really, you guys, I am soooo over winter. Maybe it was standing outside the cold snow all morning? I don’t really know, but it made me dream of when I was little at soccer games, when I was waiting on the sidelines for my turn to play we’d sit in the sun on the grass and look for flowers and four leaf clovers. 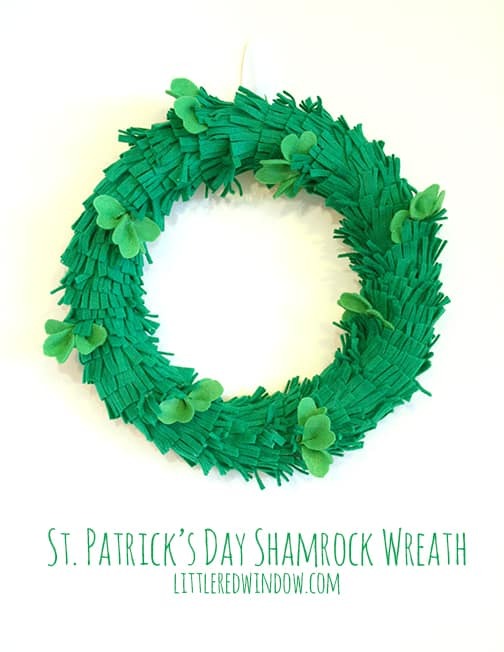 And so I made this wreath later that day and I love it and now I’m thinking maybe I DO like St. Patrick’s Day after all! 1. 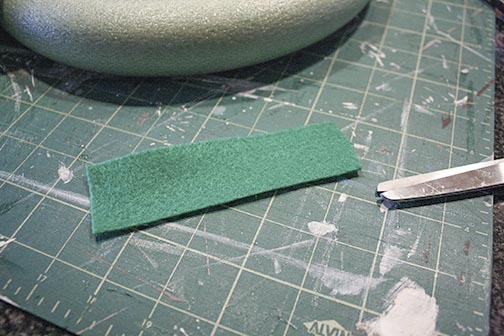 Cut strips approximately 1.5 -2 inches wide from the darker green felt. 2. 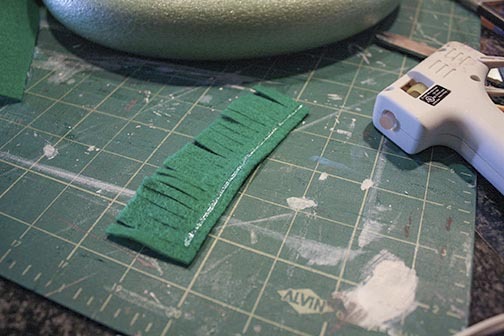 Cut the long edge of the strip into fringe by cutting down about 2/3 of the width of the strip. Don’t worry at all about your fringe being even. 3. 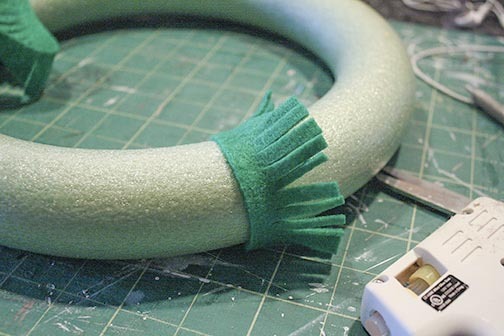 Run a bead of hot glue along the uncut long edge of the strip and wrap it around the wreath. 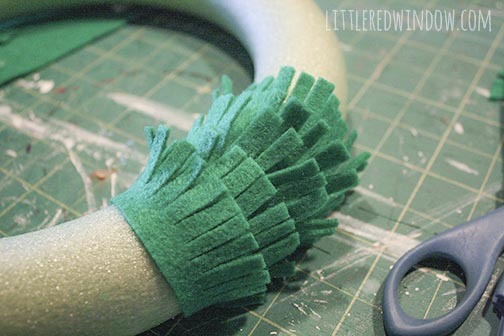 You only need to cover about 3/4 of the way around the wreath form, no one will see the back, there’s no point wasting felt to cover it! 4. Repeat overlapping the strips all the way around until the entire wreath form is covered in grass. 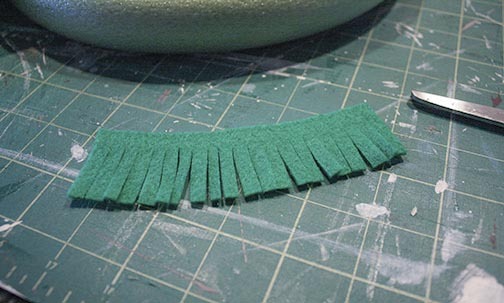 Run your hands through the fringe to muss it up so it looks more like grass. 5. 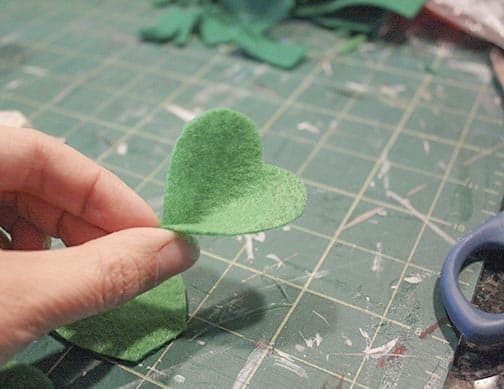 To make the shamrocks, cut three shapes that look like hearts but with flat bottoms instead of points. Mine were about 1.5 inches tall. 7. Repeat with the other two shapes. 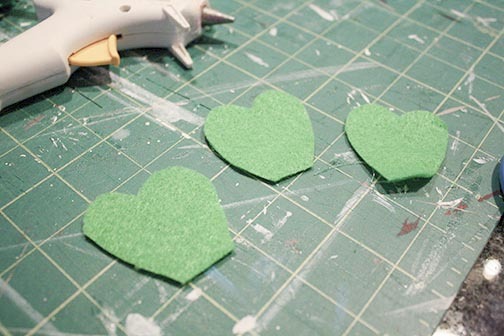 When you have three pinched heart shapes, group them together and secure with glue. 8. Using a dot of glue, nestle your shamrock into the grass. 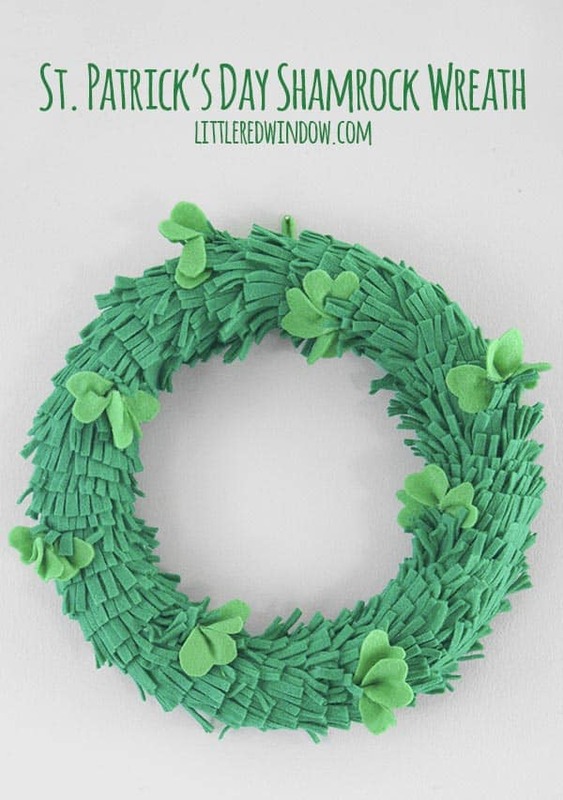 Repeat until you fill your wreath with shamrocks. Love your shamrock wreath. Looks so cute with the shamrocks growing in the grass. You explained your process of making the grass and the shamrocks so well. Keep up the good work – many of us amateurs and wannabe interior decorators can use your help! Happy St. Paddy’s Day! Thank you for joining the Anything Goes linky party! This is one of my top three favs and I’m featuring it today! Hope you join us again today! This looks fantastic! Great technique! Cassie, this looks AMAZING!!! 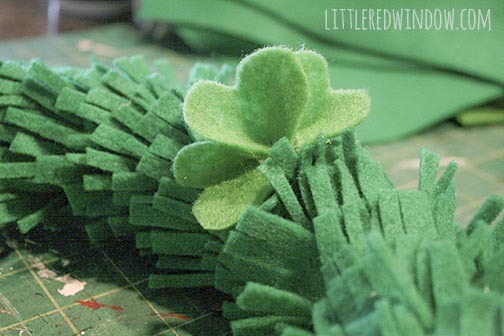 So glad you did feel inspired to create something for St. Patrick’s Day! 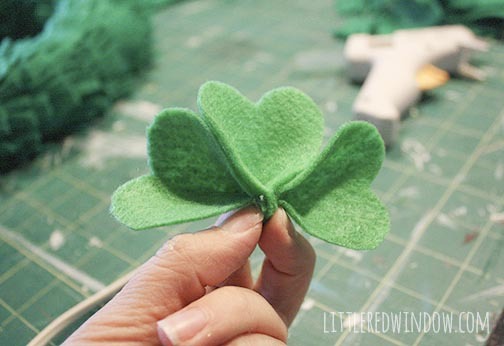 Love how you worked with the felt and made the shamrocks! Great tutorial, too! Thanks so much for sharing with us over at Decorate to Celebrate! Thanks so much Pamela, it really was a piece of cake! 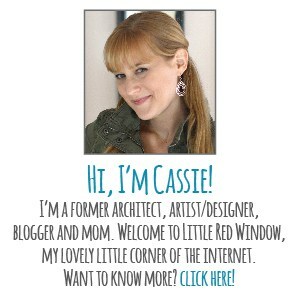 Hi Cassie:) this is a fantastic tutorial and it sure looks like fun to create. Thank you for joining us over at Decorate to Celebrate. Done! Thanks for visiting, Judy!